What Makes a 'Good Deal'? A good deal is what you buy it for versus what the home for sale is currently valued at. It would appear that the home in NW Las Vegas would be a better deal. RIGHT? Wrong, it depends on the location. Please continue reading to understand why. We all measure a good deal on a home for sale in different ways. A homebuyer looking for a home for their personal residence is going to look at homes in much the same way they would look to buy a car; compare and contrast. They view it subjectively and have a "personal or emotional" aspect to their considerations as they will actually be living in the home. While a professional Real Estate Investor will be focused more on empirical information such as price vs. value and the return on investment (ROI) as it relates to dollars. They are looking for the best financial investment or "deal". The investor is only concerned in value and price, which is considered the current "market value". When looking for a deal in the real estate market there are various variables that determine if the property is truly a good deal. Real estate pricing deals with the "valuation" or the process of estimating what the entire property (building, land, amenities, etc.) is worth. Pre-set, standard methods of determining the price or market value are applied, primarily focused and based on the lot size, the square footage of the home, the condition of the property and more importantly…location. There are no websites to date that can give you an accurate value for your home based on an algorithm, therefore sites like Zillow and Trulia are NOT accurate and in some cases far from accurate. Determining true current market value and understanding its information is what one needs when defining a home for sale as a "deal". The core essential to determine "value" is prepared by comparing the subject property to the properties sold in the same development. When analyzing the sold properties we are looking for properties sold within the last 6 months which help identify the "median" price. The "median" home price is established by organizing all comparable homes (comps) within the immediate surrounding area, from the lowest value to highest value and picking the middle one. Home price is one of the most common measurements used to compare real estate prices in different markets, areas, and time. It is said to be less biased than the "mean" (average) price since it is not as heavily influenced by a small number of very highly priced homes. Note: When looking at the comparable properties sold, cosmetics such as granite countertops, flooring and a pool and/or spa have very little, if any, meaning in determining value. Again, the most important factors are house square footage, lot square footage, location amd condition. A good deal in its simplest form is what you buy it for versus what the property is currently valued at. The "value" of an item is subjective, while its price is relatively fixed. Two people may see the same item as having different values even when the price is the same. When dealing with real estate there are many true misconceptions of what a deal truly is. What a deal is labeled has nothing to do with determining if it’s a deal. Meaning, just because it’s a foreclosed home which is a bank owned home or a short sale which is a type of pre-foreclosure does not mean you’re getting a deal. A deal is what you pay for it versus what it’s currently worth. Past value does not dictate future value. Just because a home sold for $600,000.00 in 2006 and now sells for $300,000.00 does not make it a deal or mean that it will be worth $600,000.00 ever again. Real estate is not like the stock market. There are fewer factors and people tend to over complicate the process. The most important factors when discussing the market is SUPPLY of homes and interest rates. There is no such thing as a real estate bubble. A bubble would dictate a burst or a pop. Meaning one day your home is worth $400,000.00, the next day its worth $275,000.00. Again, real estate is not the stock market. Although Las Vegas Real Estate is more volatile than most markets it still takes 3-6 months to change. You can see it coming if you pay attention! If you heard it on the news you’re already late, that’s why it is the news, it already happened. Having a knowledgeable Las Vegas Realtor that knows the market and the Nevada foreclosure process can get you inside up front information can be a huge advantage. Price per square foot is generally used for builders and investors who are buying homes to rent out. 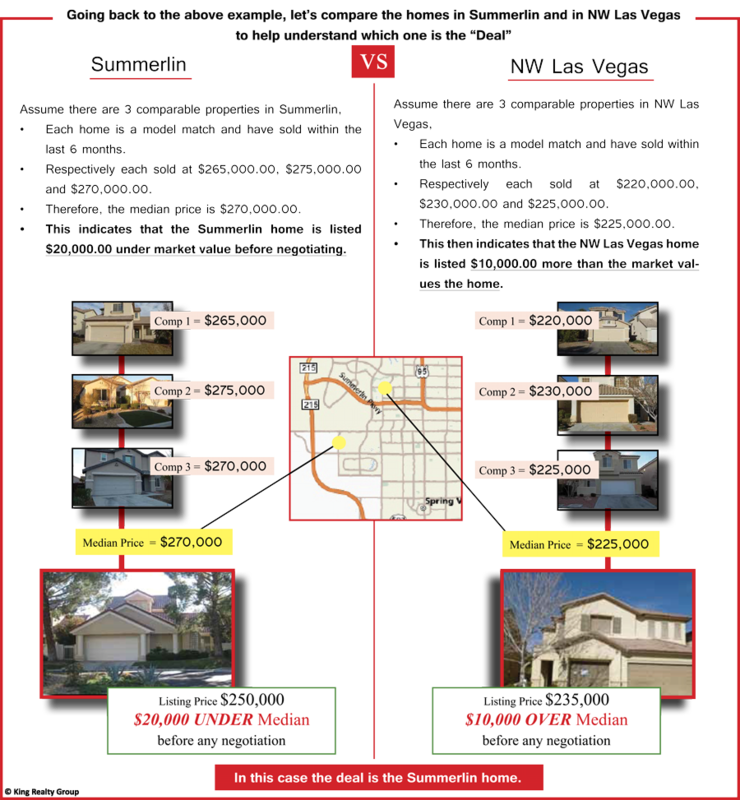 If you’re going off average price per square foot for Las Vegas and Henderson homes when determining if the property is a deal you’re doing it wrong. You can average out price per square foot for a subdivision, but that’s extra work not needed. Comps are the best. For example, in Las Vegas the average price per square foot is $80.00. If we found you a home for $117.00 per square foot in Canyon Gate and the average price per square foot in Canyon Gate is $150.00, would you buy it knowing it is $37.00 per square foot more than the average Las Vegas price per square foot? If you said no, then you’re making a poor decision. There is no national economy of Real Estate. Real Estate is must more micro. Sure there are national statistics but what happens in New Jersey has no effect on what happens in Las Vegas real estate. while getting your true dollar’s worth and end up getting the Deal you’re looking for.